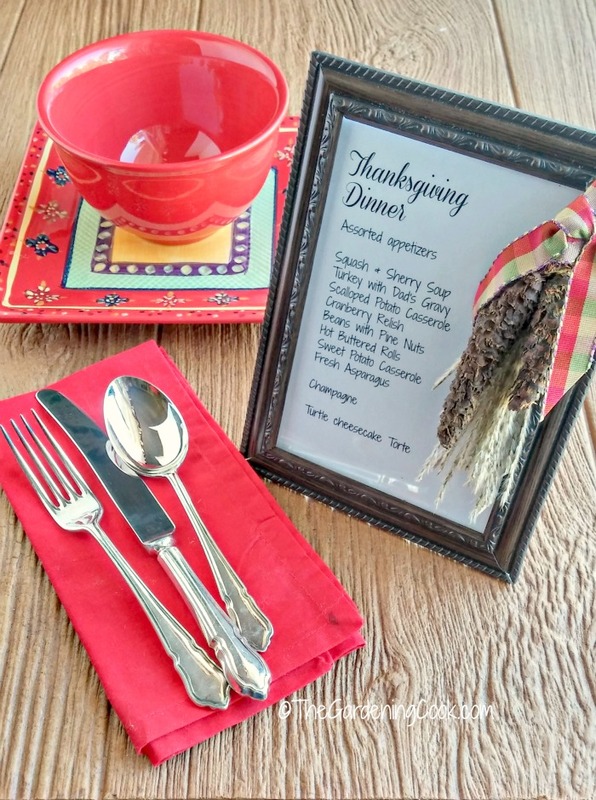 This framed Thanksgiving menu is a tasteful and professional way to let your dinner guests know what will be on the menu for the holiday. 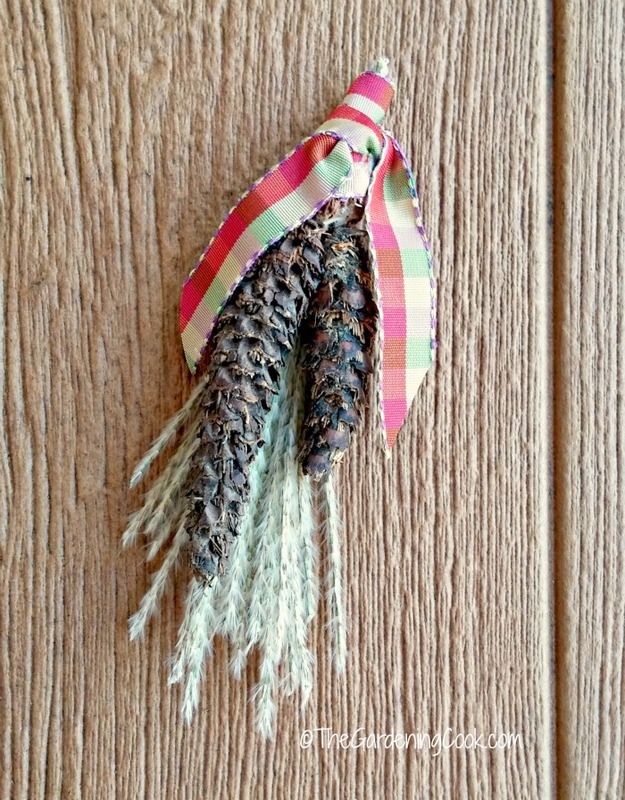 It is easy to make with a few supplies and some greenery from your yard. 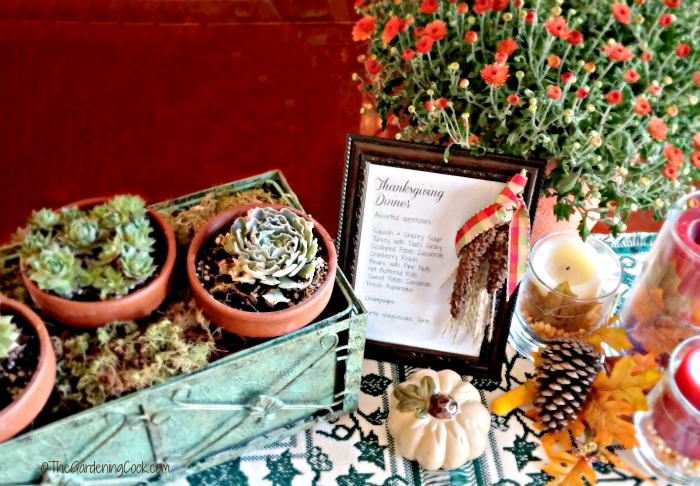 Thanksgiving tablescapes often make use of a centerpiece that gets showcased in the center of a table. This idea would make a perfect addition to any holiday table. Thanksgiving is a time for family. I love to gather all my special people in one place and treat them to a lovingly prepared home cooked meal of turkey and all the trimmings. Alas, my real family is in Maine and my daughter lives in California, so family is far away on this special day. When we cannot spend the holiday with them, my husband and I ask over some of our closest friends, who also have no nearby family, to celebrate the day with us. 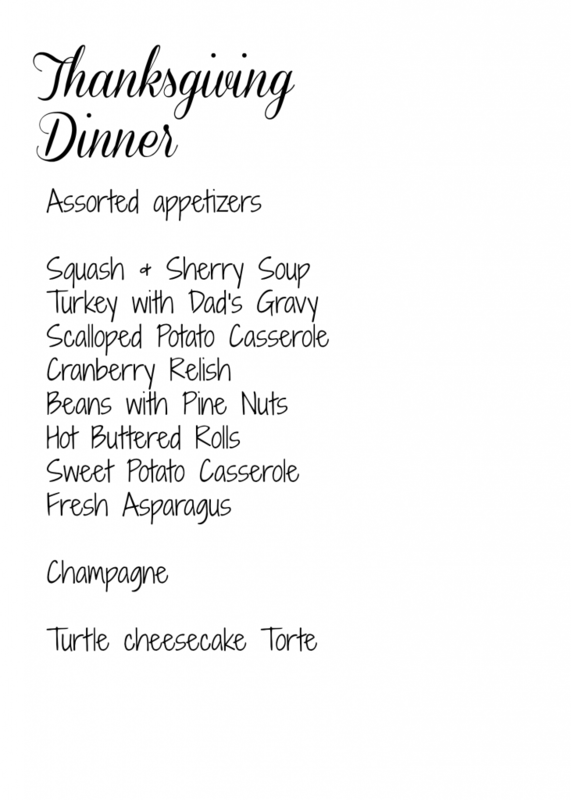 This Thanksgiving dinner menu plaque will be featured on our table this year. It will show all of our guests what is on the menu this year. 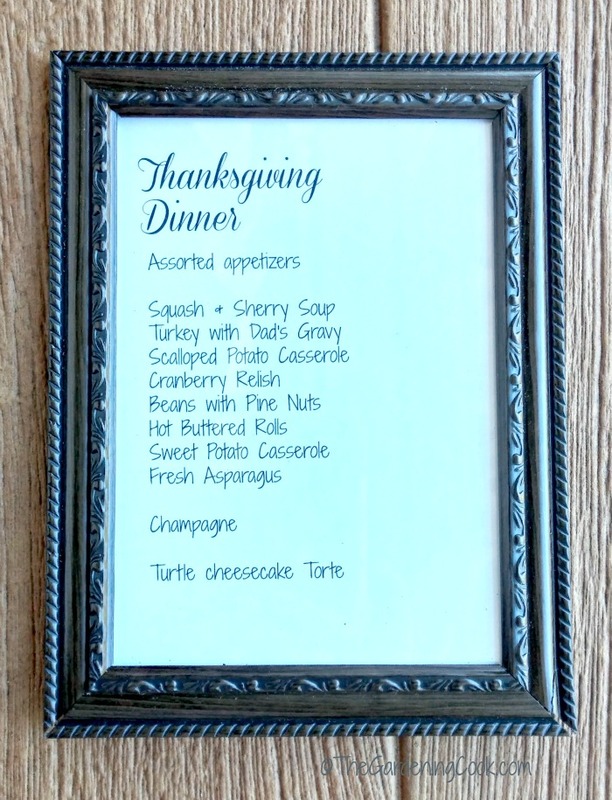 Let your holiday guests know what will be on the menu with this framed Thanksgiving menu. This year I’m hoping to have a group of almost 10 for Thanksgiving. This might not seem huge to all of you who host huge families, but for someone who has no family nearby, this is a BIG group for me. I’m already thinking ahead to how I will decorate the dining room and table and this is the first of my projects for the occasion. Greenery from your garden. Could be grasses, wheat or any other seasonal looking bits and pieces. 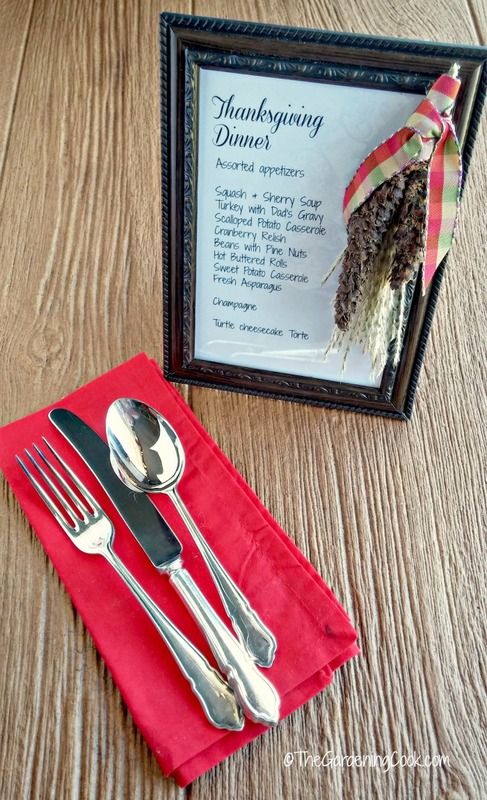 A printed menu on white card stock paper. Start by printing out your menu on the white card stock. I did mine on PicMonkey I have the premium version of the program, which offers a lot more fonts and options than the free program. The size of the finished menu to equal a 5 x 7 frame is 1500 x 2100 pixels. Then I printed it on Paint Shop pro and chose 5 x 7 inches as my printing size. I kept my printing to the left side of the menu to allow for the decorations to the frame. 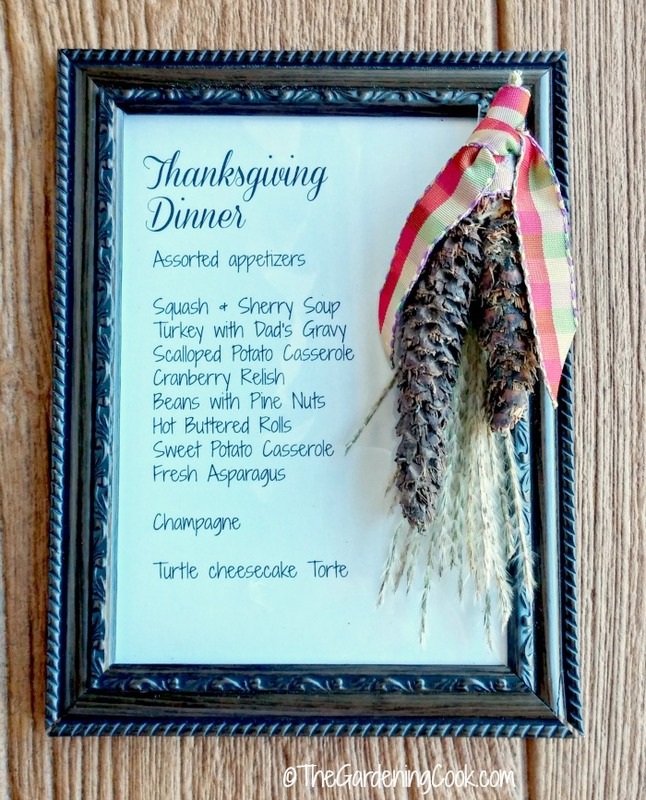 Next step in making this framed Thanksgiving menu is easy! Cut the print out to 5 x 7 and put the menu in the frame. LOL. Don’tca just love easy projects? I had been collecting pine cones on all my morning walks. Each time I came home with three that I thought would be the right size, and each time they were too big! I finally found them in my front yard under the pine tree. The squirrels had been munching on some baby cones and nibbled them down to the exact size I needed! I glued two of the pine cones together and then used a pair of ratcheting pruners to cut a pine cone piece off to attach it to the top of the pair. Why ratcheting pruners? Well let me just say that pine cones and scissor are not a match made in heaven. Those babies are tough. I now need a new pair of scissors thanks to them. It was like trying to cut a tree trunk! The next step was to trim off some pieces of the Japanese maple frond to make it smaller so it would fit the frame. The piece of ribbone that I cut was about 14 inches long and 5/8″ wide. 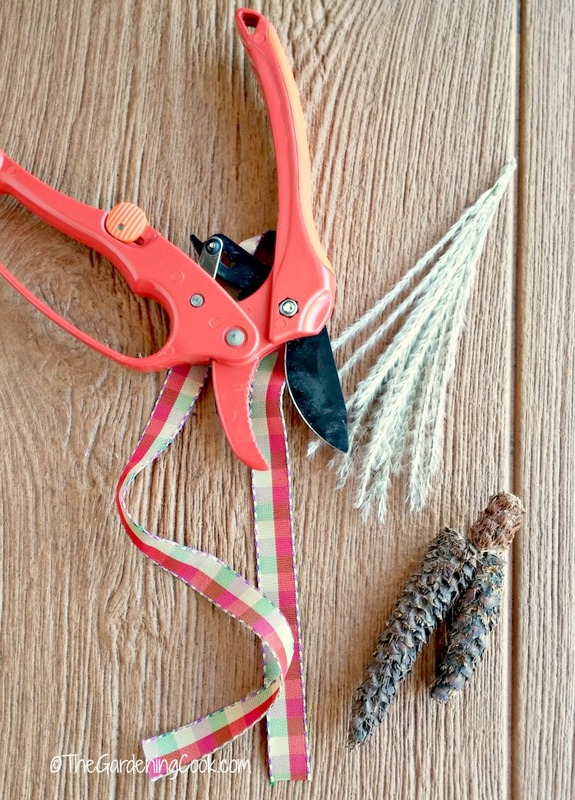 Use the hot glue gun to attach the frond to the back of the glued pine cones and then wrap the ribbon around the part of the pine cone that sticks up. Dot it with some hot glue to keep it in place and trim the edges on the diagonal. Almost done! The final step is to add a strip of hot glue to the top right corner of the picture frame and glue the greenery and ribbon in place. Voila! I can hardly wait for Thanksgiving to arrive to host my party with all the delicious food and show off my new dinner menu plaque. I think my guests will love it! 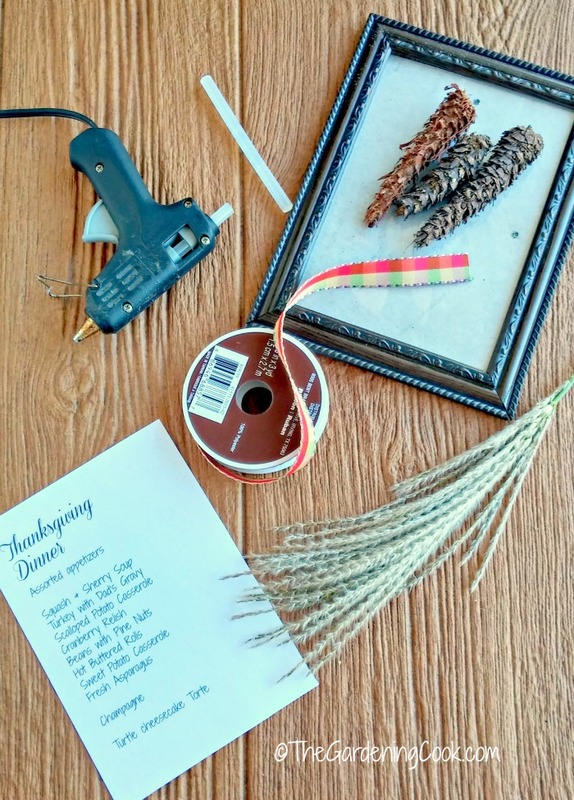 And one of the best things for me (who loves to reuse craft supplies) is that I can take off the pine cones when Thanksgiving is done and make it into a Christmas menu plaque. I’m already looking through my craft drawer to see what I can use! Do you use greenery in your yard to decorate for the holidays? Please tell me about it in the comments below. I would love to hear your creative ideas. This is a great idea! People always wonder what’s on the menu at these types of events and having a menu card is a great way to communicate it!! I think I will do another one for Christmas too! What a great idea for the holiday dinner crowd. Thanks Renee. It was a fun project to make. I love this idea. Your menu sign turned out really nice. For the first time in years the hubby and I are both off this Thanksgiving and the day after, so we were going to see if the family wanted to come here this year (if ok with my mother, it is the tradition for everyone to go to her house) but she’s getting older and both my girls and grandkids will all be here this year so it would be less hectic for her and she can just sit back and relax an enjoy her great grandkids, and grandbaby. I do use greenery and flowers from my garden but not to decorate with, I take them every year to the cemetery for my dad’s birthday, and hoilday’s, I think there so much prettier then fake and I know he would love them. sounds like you have a wonderful holiday planned Linda.